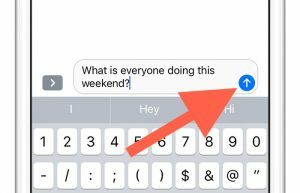 This article is going to guide you on step by step on how to delete single messages on iPhone iMessage. This will help you have good knowledge of how to have other conversations using iPhone. 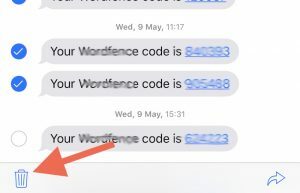 It will also work if you are using the iMessage application. In today’s world, you may find that you have many reasons as to why you want to delete single messages on your iPhone. 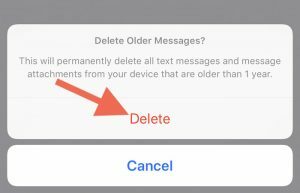 With the iMessage app and the features, it has, deleting your unwanted messages will be done in a few steps. The steps work on both iPhone and iPad. Regardless of the fact that with this steps you will get rid of single messages and other messages from your iPhone completely, it doesn’t eliminate the possibility of being spied on. This is due to the fact that it has become easy to acquire spy apps like mSpy which enables privy people to read your messages even if you have deleted them. Let us go through the procedures of getting rid of your unwanted messages. When one conversing, massages can be used to send photos, personalized animated gifts, videos and other features provided by iMessage. These simple steps will guide you on how you can one conversation. Tap the iMessage app and add a contact or tap on an existing conversation. Then tap on the text field and go on with typing your message. Tap on “send“ when you are done with typing. 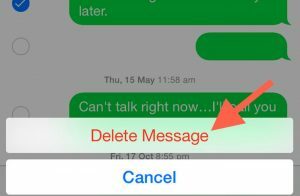 You can follow the following simple procedure to delete single messages on your iPhone. Tap on the message app on the home screen. Click on the conversation containing the message you want to delete. Tap and hold the message you want to delete. On the populist up menu, tap more. You can select the specific message you want to delete. On the lower left there is a trash icon, tap it. Confirm that you want to delete the message by tapping the delete message on the pop-up menu. If there is a need for you to delete multiple messages at once, you don’t need to open each message. They can rather be erased in a very quick and simple way by following the procedure below. Open the message app on your iPhone by tapping on it. Tap on the “Edit” icon on the left upper left corner. Proceed to select the messages you want to delete. The delete icon which looks like a bin is on the lower right corner – tap it to delete the messages. Sometimes when doing a spotlight search, certain text message conversations show up. This may prove to be somewhat annoying and embarrassing. Worry no more for you can prevent this carrying out the following action. 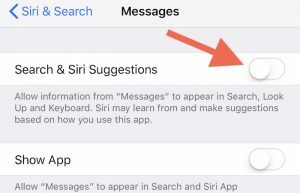 On your iPhone, go to “Settings” and select the “Siri and Search“. You can scroll down until you reach Messages. Switch the button to the off status. When the button changes off, its color turns to white. Your phone may be having hundreds of messages and you want to delete all of them at once. You need not worry about the following steps will save you the energy of deleting single messages. Open the “Settings” and go to “Messages“. Tap on Messages to open and go to “Keep Messages“. Choose how long you want the messages to be kept e.g. 1 year, forever, 30 days. The messages may be many in your phone possibly because the forever option is selected. Depending on the choice you make, you will get a warning that the messages beyond that date will be deleted. If you chose 1 year then the messages older than one year will be deleted automatically. The same applies to 30 days with the exemption of forever. 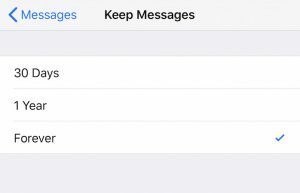 You can reclaim space on your iPhone without having to delete messages on your own. This 9 been made possible by the iMessage app which allows you to get rid of messages after a period of time. The following procedure is ideal for performing this task. Tap the “Settings” app on your iPhone or iPad. Open “Keep Messages” which are under the message history section. Then select how long you want to keep the messages – this may be 30 days or even 1 year. 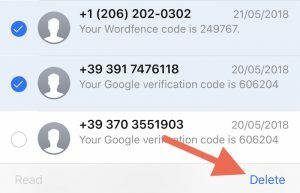 Finally, tap on the “Delete” option to confirm that you want iOS to delete messages which run beyond that selected period of time. Once you have performed this action there is no going back – it cannot be undone. 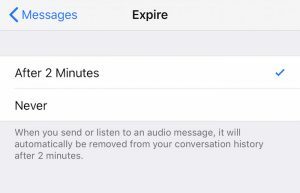 Due to the size of video and audio messages, iMessage app allows you to auto delete them faster than the time given or messages. The sweet part of this set period of time is that the messages cannot get deleted until you have listened to them or viewed the video – after this then the timer starts counting. You can follow this procedure to auto-delete them. Go to the “Settings” app on your iPhone. Go to “Expire” under the audio messages and the video messages section. You can choose between never and after 2 minutes. If you don’t want to worry about space on your iPhone, then it will be better if you set them to expire after two minutes. The following procedure can be followed. Click and hold the message you want to delete. On the pop-up menu, tap “More“. You can select the specific message you want to delete. On the lower left there is a trash icon, tap it. By now I believe you have learned and you have grasped on how to delete messages on your iPhone starting from how to one conversation, how to delete single messages on iPhone, how to delete multiple conversations, prevention of text messages showing up on spotlight search to how to delete a message that was sent.